Palmas De Mallorca Condominium is luxury living at its finest and located in Daytona Beach Shores! 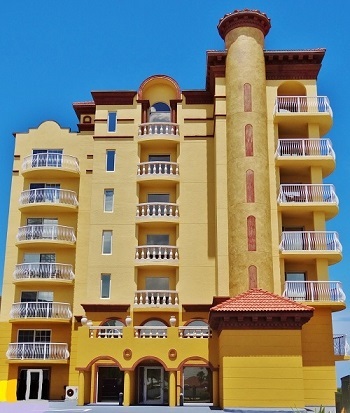 This 7 floor, 14 unit oceanfront condo is on the no drive beach. All units are direct oceanfront and the views from the balconies are unbelievable! The architecture was influenced by The Island of Mallorca and there are only two units per floor. This is also one of the only complexes that does not have pet restrictions. Each unit has its own semi private elevator and lobby area. The building is equipped with an outdoor pool, fitness center, hot tub, sauna, underground parking and onsite security. Units can be rented monthly which can make this a great vacation home or income producing real estate!